Iwakuni is located 300 miles West of Osaka and 30 miles from Hiroshima. Tokyo is 600 miles East of Iwakuni. 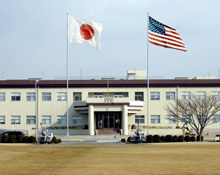 Naval Air Station, Iwakuni was commissioned July 8, 1940. MCAS Iwakuni's mission is to provide support to U.S. and Allied interests safely, effectively, and efficiently through a unified effort.